ULTRA STABLE: The tripod fork is finely crafted by using our precision CNC machine to ensure the highest quality product. 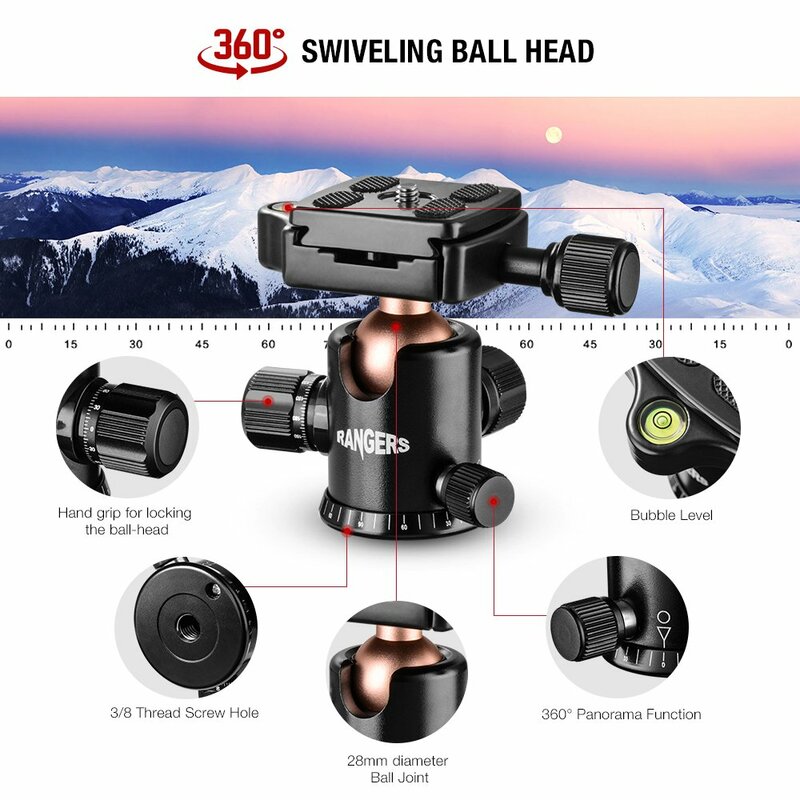 360° PANORAMA: With two independent control knobs, the specially designed ball-head can rotate 360° allowing you to get the perfect shot every time. The ball-head also has two built-in levels which allows you to get the straightest shot possible. 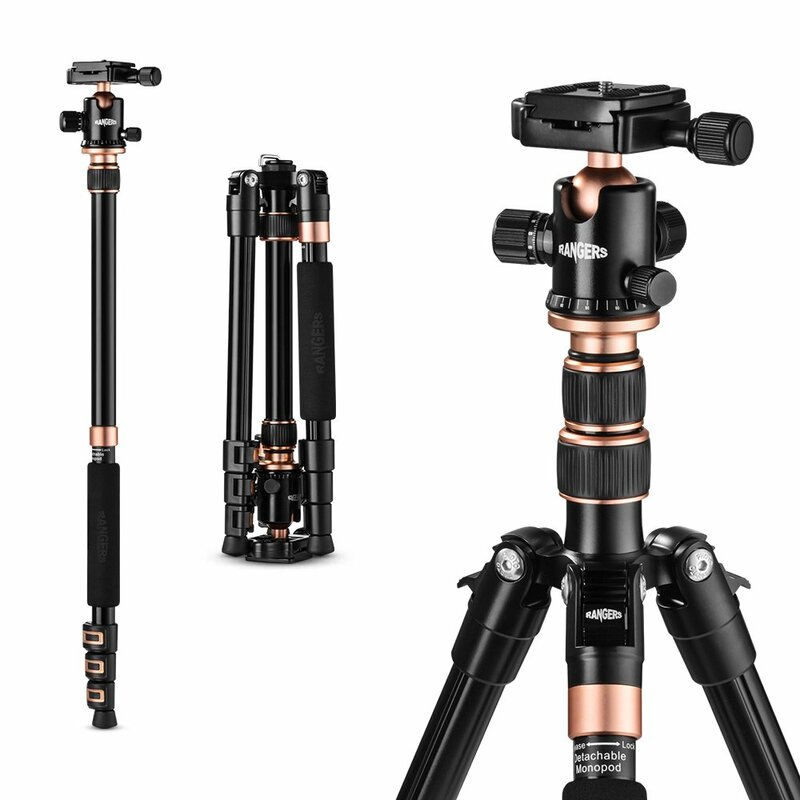 EASY SET UP: 4-section column legs with quick release flip-locks allows you to adjust the working height from 14″ to 55. 5″ in seconds. Feature: 4-section column legs with quick release flip-locks allows you to adjust the working height from 14″ to 55″ in seconds. 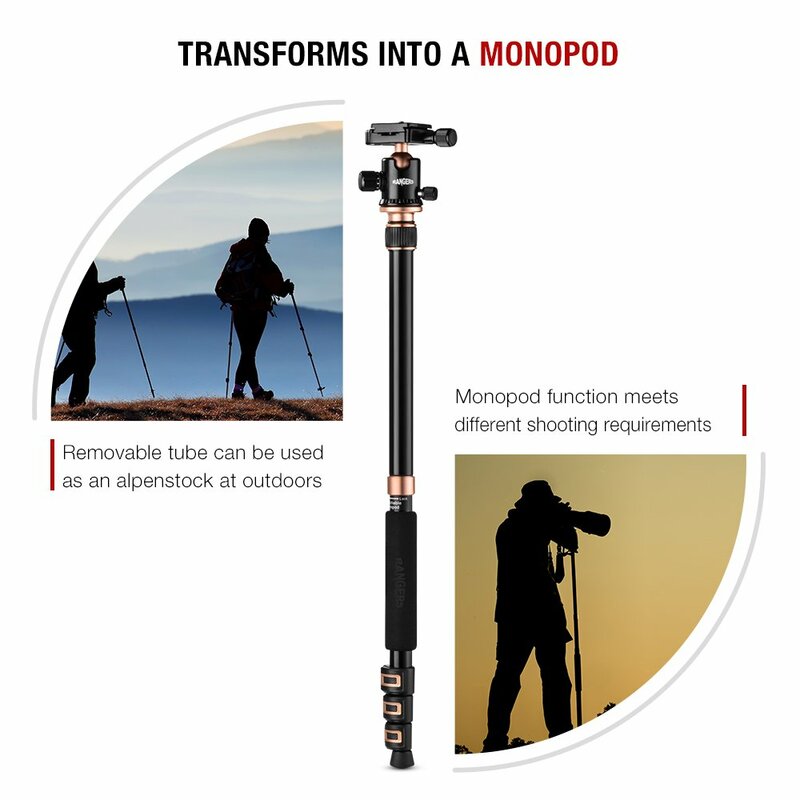 This tripod also features a removable leg that can be converted into a monopod when attached to the included ball-adaptor. 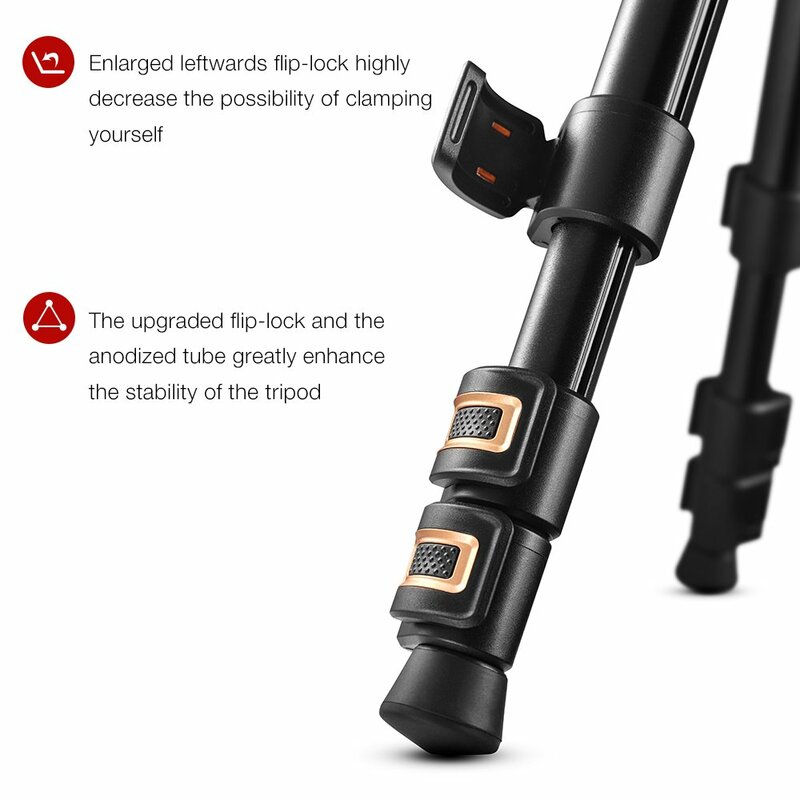 Newly designed Flip-lock has a larger contact area with tripod leg that brings greater stability when shooting. With two independent control knobs, the specially designed ball-head can rotate 360° allowing you to get the perfect shot every time. 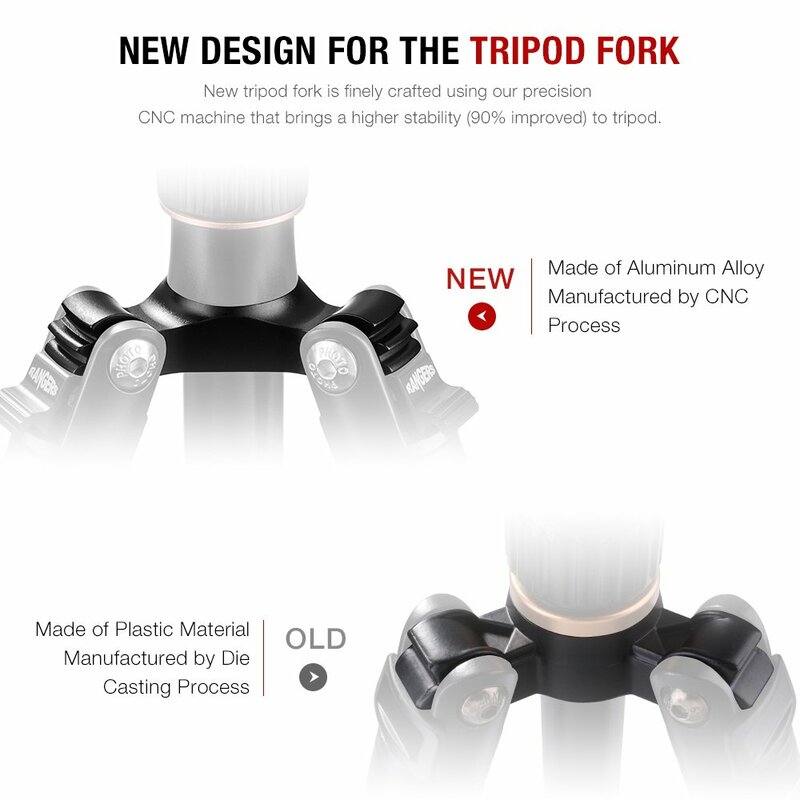 The tripod fork is finely crafted by using our precision CNC machine to ensure the highest quality product. 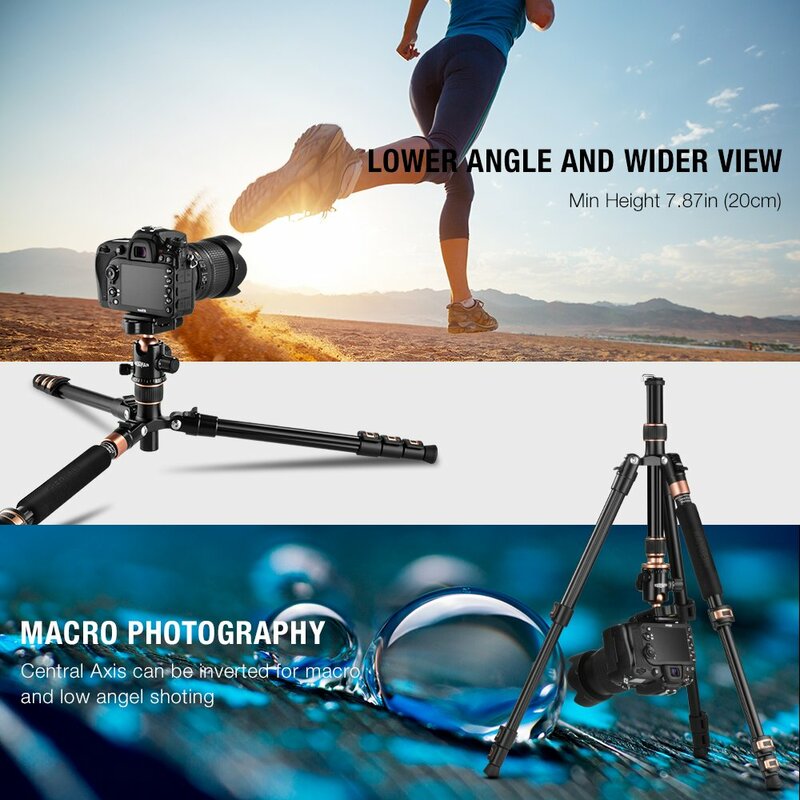 The center axis can be inverted to give you the option for low shooting angles patible With: Canon, Nikon, Sony, Leica, Fuji-Film, Pentax, Lumix, Olympus Specification: Tripod: Material: High-density Aluminum alloy Max Load Capacity: 26. 5 lbs. / 12kgMax Height: 55. 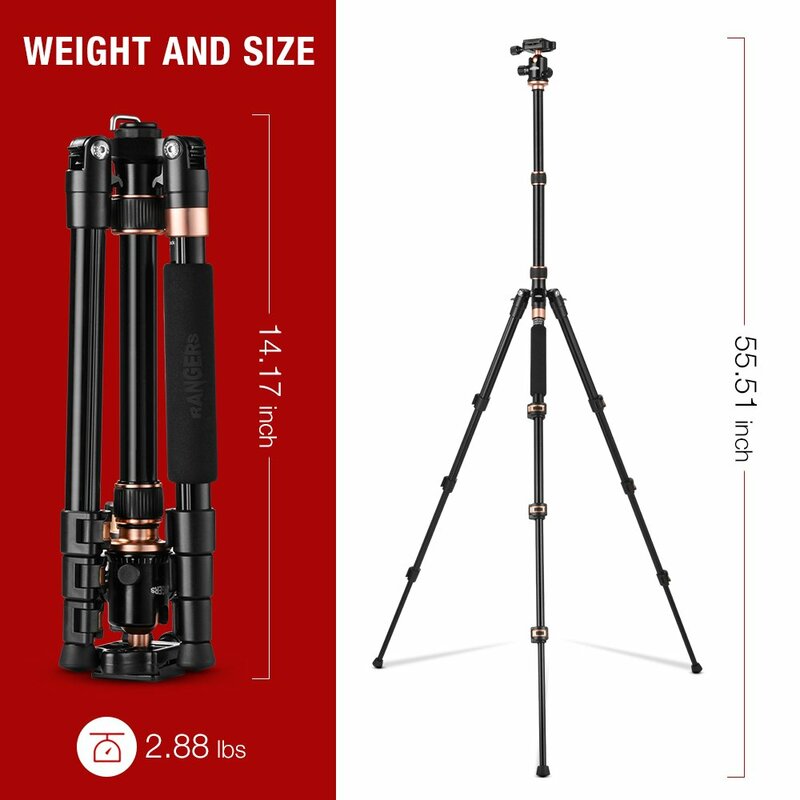 5 in / 1410 Minimum Height: 15 in / 385 mm Storage Length: 14 in / 360 Maximum Height converted to Monopod: 57 in / 1450 mm Leg Lock Type: Flip Lock Number of Leg Sections: 4Max Tube Diameter: 23mmMix Tube Diameter: 14 mm Weight: 2. 89 lbs. / 1. 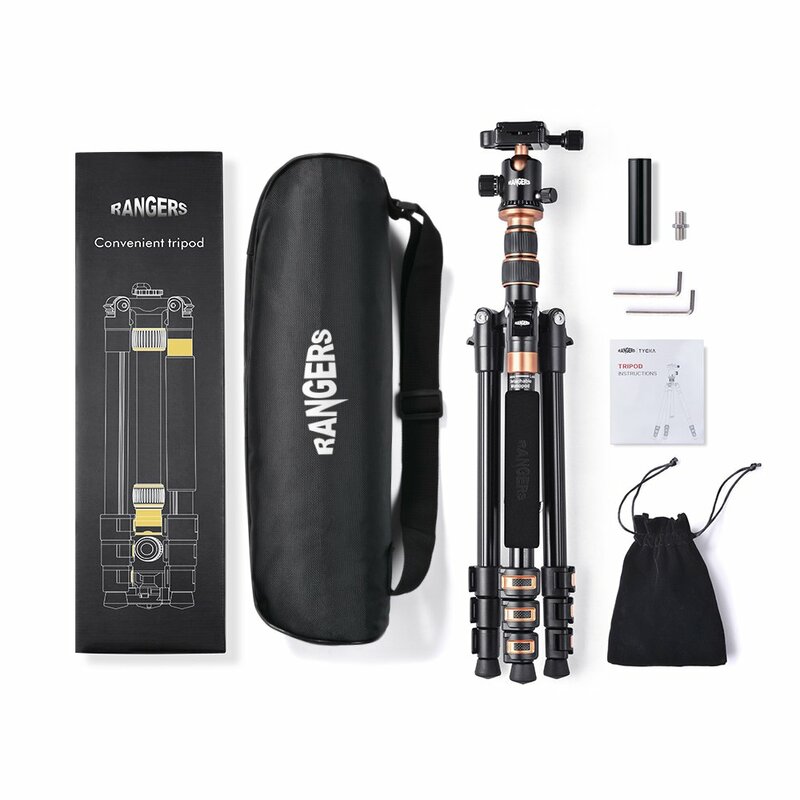 31kg(Includes Ball-head)Ball-head: Tilt Range: -45° / +90°PanningRange: 360°SeparatePanning Lock: Yes One Built-in Bubble Level Indicators Head Mount Thread Size: 3/4 in Quick Release Thread: 1/4 in Includes: 1 x Rangers 55. 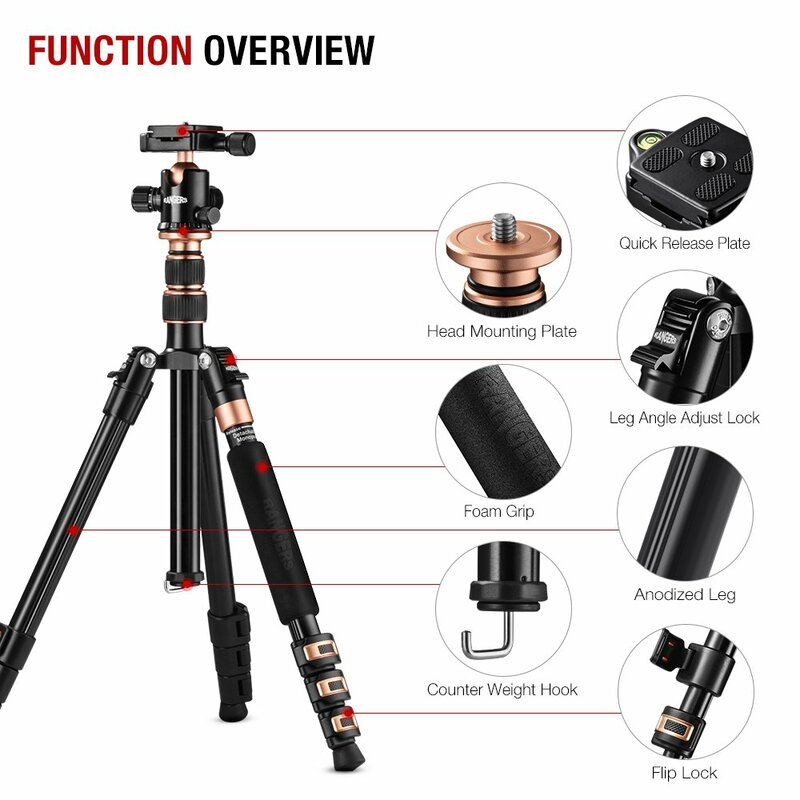 5″ Tripod withball-head1 x Carrying bag2 x Wrench1 Manual Please if you need more help. PORTABLE: 14″ compact storage size and 2. 89 lbs. weight, you can easily take it to anywhere for outdoor shooting. : Backed with 2-year . Please if you need more help.